Zion Evrony, Israel's ambassador to the Holy See, the government of the Roman Catholic Church, stressed on Wednesday that the latest attacks on Christian holy sites in Jerusalem are damaging Israel's public image. 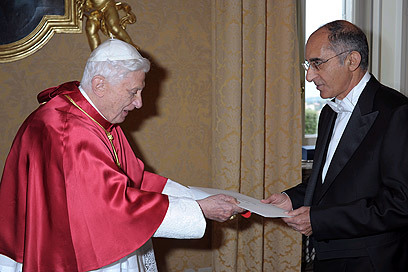 Evrony met Pope Benedict XVI at his summer residence near Rome last Friday, and the two discussed the relations between Israel and the Vatican. Evrony said that the pope and other Catholic Church officials have yet to comment on the alleged Jewish acts of vandalism.. In addition, Evrony said that the recent "price tag" assaults led to Catholic, Italian and global condemnation of Israel. "The Jewish terror acts portray Israel in a negative light, which does not accurately reflect the freedom of religion in Israel." On Tuesday, unknown vandals sprayed graffiti defamatory to Jesus on the walls of a Franciscan Dormition monastery on Mount Zion in Jerusalem. The inscriptions, reading "Jesus, son of a…" and "price tag," were tagged with blue paint on the church's gate. In spite of Evrony's statement, local Italian media outlets said that this incident was not an unusual event, adding that over the past three years in Christians were victimized throughout the region by Jews a well as Muslims. Nonetheless, Evrony's meeting with the pope was a positive one. The ambassador presented the pope with a giftc - a gold pleated dove with the following words inscribed onto it: "The man of peace is granted with the symbol of peace." Pope Benedict XVI also asked the ambassador about the health and well-being of President Shimon Peres. He further conveyed his blessing to him and to the people of Israel. See all talkbacks "Israel's Vatican envoy: Offending Christianity harms Israel"